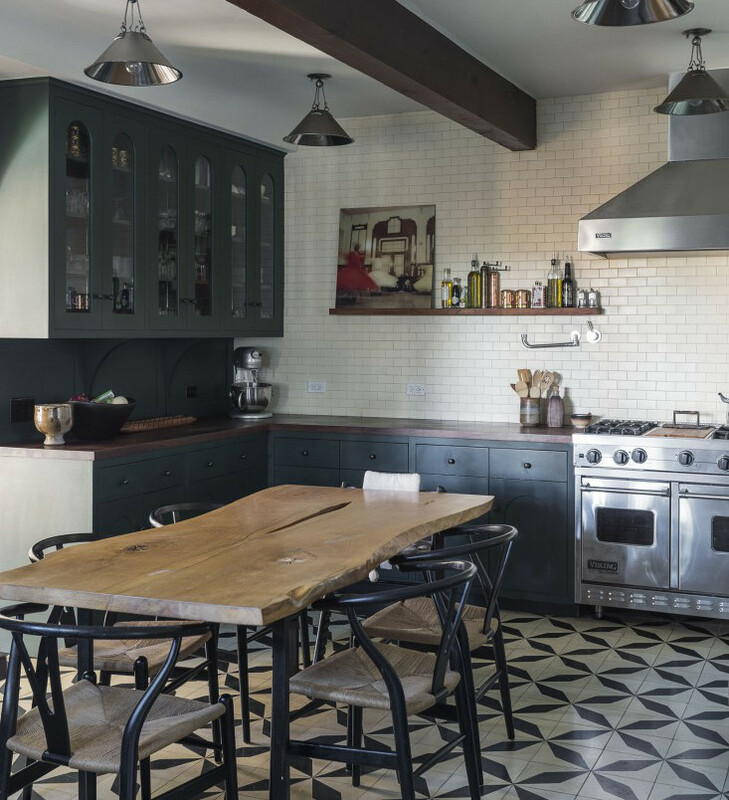 Will dark green kitchens slowly replace black for those who favor intense inky hues? 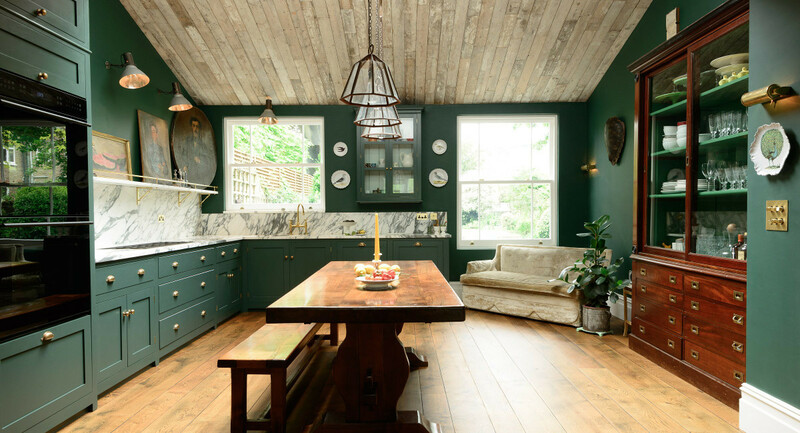 Green is coming into its own in the kitchen and dark green kitchens — call them inky green or British racing green — look very current to me. Perhaps that’s because black and near-black led us to yearning for a bit more color. Let me quickly say that these greens are not pure jewel tones like emerald because they are more muted, meaning they contain more black. 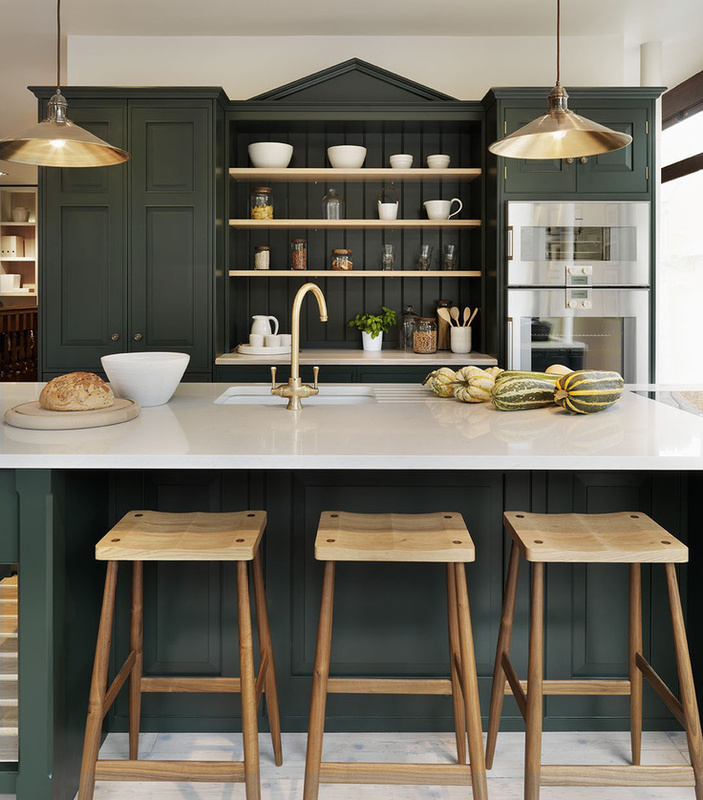 A dull green-black distinguishes Teddy Edwards’ Brooklands range kitchen [top]. A Georgian style pediment helps finish off the center of the tall cabinet wall. The deep color nearly disappears on the base of the island, no? This side view shows how deep colors tend to make cabinets look massive and imposing — even against a very light floor and white walls. 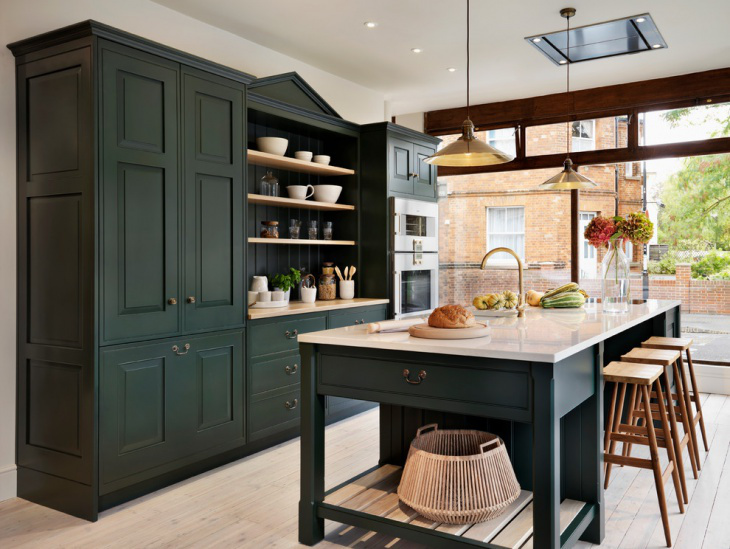 One of the brightest in the bunch is DeVol’s Peckham Rye kitchen, which the brand describes as a mix of emerald and British racing green. It also looks like a deep pine green. Walls are painted to blend with the cabinets while the active white marble and white trim tie into the windows. Pale natural wood on the ceiling keeps the dark walls from becoming oppressive. The mix is interesting with three more wood tones — the floor, the tavern table and the mahogany dresser. 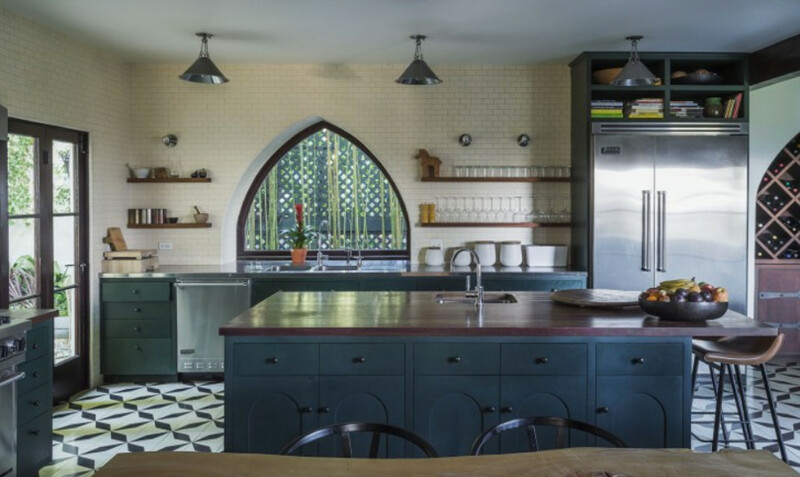 For the renovated kitchen in a Spanish colonial house in Los Angeles, three rooms were combined and a Moorish arch window was introduced by Commune designers Pam and Ramin Shamshiri, of Ace Hotel fame. The deep green was inspired by a door Ramin Shamshiri saw in the Netherlands and immediately reminded me of Fine Paints of Europe WC 60 or 64. Dark walnut, used for the island’s countertop preserves the moodiness. White subway tiles from counter to ceiling help balance the dark cabinets while the bold pattern of the black and white floor tiles looks fairly subdued. Remodelista did an extensive post on this kitchen which includes sources. High gloss green cabinets suggest sports car culture though Bailey McCarthy’s serious white CornueFe range pulls it back. Again, white subways keep things light and bright and to offset the mass of dark cabinets, a marble-topped rolling cart doubles as an island and work center. 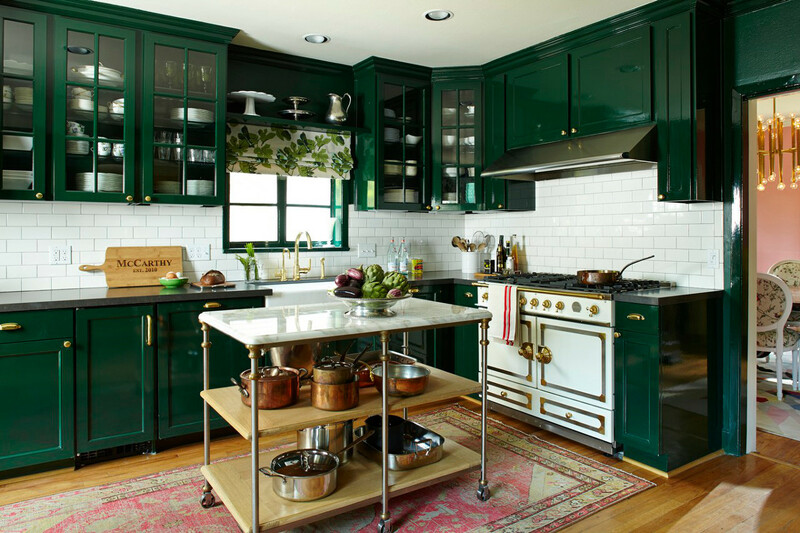 But the high impact of lacquered dark green cabinets cannot be denied.